The weather is getting warmer and therefore I am ready to spend more time outside with my family. I am always searching online for activities and events for us, as well as asking friends/family for recommendations of where to go. I am always looking for activities that are budget-friendly. I am determined for my 5-year-old daughter and my 2-year-old son to have a full and eventful childhood. I wrote down a few events I thought the children should be exposed to and one’s they would absolutely love and put them on my calendar for the spring and summer season. However, my calendar is not filled, but you must start somewhere right? 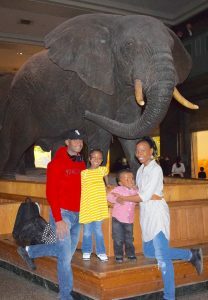 One of the places I always wanted to take my children to is the museum and that was one of our April family trips. 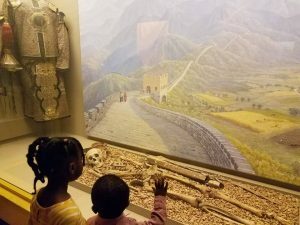 I always told myself when I had children I would make sure we visit the museum and I would expose them to both fun-filled entertaining activities and educational activities. I’m so glad we went to the museum because they had a blast; they had more fun than I expected. 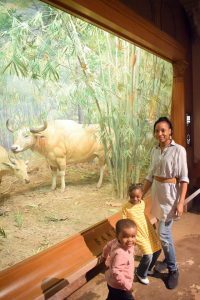 My husband and I decided to go to the American Museum of Natural History in New York City, so we could visit the Egyptian/Mummy Exhibit. Our children ate breakfast in the morning, so they wouldn’t be hungry while we traveled. I made sure to pack some snacks and juice, just in case they were hungry while we were at the museum because I did not want to purchase any food at the museum’s food court. I could only imagine how expensive food items would be there. I also packed an extra change of clothes for the children, just in case they had an accident. I like to be prepared. We took the Long Island Rail Road to 34th street- Penn Station and then we had to catch the C train to 81st street. The trains were a mess, as they usually are on the weekends, and we ended up taking the 1 train which puts us further away from the museum. After we exited the train station we walked for a while, but it wasn’t that bad because we found a local pizza shop (Ray’s Pizza) where we would go to eat after the museum, which was a great budget-friendly alternative to UNO’s pizzeria (our original plan). We paid under $5 for admission into the museum for a family of 4. Museums allow you to pay-what- you-wish if you purchase your tickets in person. We 1st took the children to the bathroom before we began our journey of Egyptology. Earlier in the week I watched videos about Egypt with my children, we looked through my Egyptian book and pictures from when I went in 2000, and we watched Little Einstein’s episodes about Egypt. Now the children were going to see Egypt for themselves up close. However, as I looked through the map there was no Egyptian exhibit present. Something had to be wrong. I asked a museum staff member for the location of the Egyptian exhibit and she informed me they didn’t have one. I pulled out my phone to look online and that’s when I noticed the Mummies in Egypt exhibit ended on January 7, 2018. I was so disappointed, but I decided since we’re already here we should just look around. 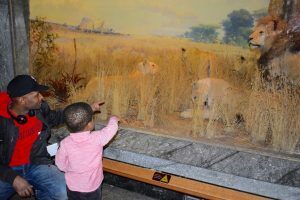 I thought the children would be disappointed, but they had a blast looking at all the animals and roaring at the lions and tigers. They asked questions about the different artifacts, statues, paintings, representations of the people from different cultures and religions, etc. Our children were so excited as they ran from exhibit to exhibit. And of course, the snacks I packed came in handy. They had a blast and my daughter said she wants to go back to the museum. We took lots of pictures at the museum and then we left and went to Ray’s Pizza to eat. We paid about $20 for the whole day. We had a fun-filled, budget-friendly family trip. I’m so thrilled that their 1st museum trip was a success. Save your money. You don’t have to break the bank when traveling with your children. They are happy to simply be with you and go somewhere new. Admission to the museum is Pay-What-You-Wish, so be sure to do just that. If you’re going to the museum to see an exhibit, make sure you check to see that the exhibit is still available before you go. Make sure you prepare your day beforehand and look for alternative routes if you’re going to take public transportation. Don’t rush. Make sure your children have time to eat breakfast before you go and be sure to pack a lunch for them because they will ask for it. If you pack their lunch, then you won’t have to worry about spending money at the museum’s food court. Take tons of pictures and have fun.